Over the past couple of years, I’ve written about an innovative an small UK based biotech firm, Oxitec, which has developed genetically modified male mosquitos, sometimes referred to as Frankensquitos (at term I fully embrace as being both ironic and descriptive) that would mate with wild females. Those females would produce offspring that would not survive to adults, because they require an antibiotic, tetracycline, in their diet, something that isn’t usually available in the the wild. Over time, with multiple releases of males, the population of the Aedes aegypti mosquito, which is the vector for transmitting Dengue fever. would fall to such a level that transmission of the the disease would be significantly reduced, if not completely stopped. The benefits of this type of control of the mosquito are tremendous. First, and most important, is that it avoids the use of pesticides which has infinitely more downsides to the environment than any imagined beliefs about genetically modified mosquitoes. Pesticides also have effects on other species of insects that are not an issue, or even other organisms including birds and mammals. To significantly reduce a pest like a single species of mosquito without pesticides should be considered a huge environmental win. Second, because the modified mosquito only lasts one generation, the net effect to the environment is only one generation, essentially 2-4 weeks, much shorter than any pesticide. 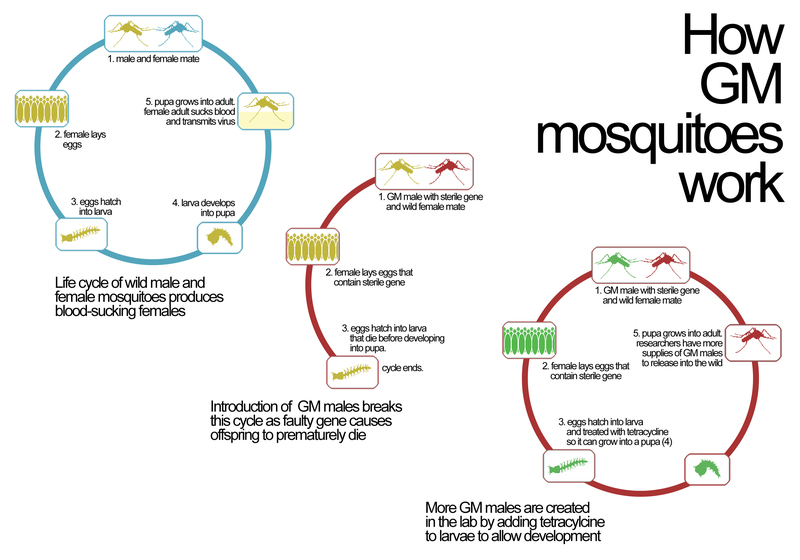 So there isn’t a persistent population of genetically modified mosquitoes, all of the ones that descend from the modified males would perish before making a next generation. Third, it is more efficient and effective than the dominant method for reducing insect populations–the “sterile insect technique” (SIT), which relies upon radiation to sterilize males, which are then released into infested areas to mate. Unfortunately this approach, which has been used since the middle of the last century, has not been effective with mosquitoes, as a result of the fragility of radiated males. Back to why we could use these Frankensquitos. Although Dengue fever is rare in the USA, there have been outbreaks in 2009 and 2010 in the Florida Keys, and one in 2005 in Texas. And with higher temperatures and sea level rises, the mosquito vectors for Dengue will move further and further north putting more of the world population at risk. But still, after several years of testing, the crazy internet still is opposed to the release of these so-called Frankensquitos. But the real science, published in one of the top scientific journals in the world, Nature Biotechnology, shows that it works. We report data from the first open-field trial involving a strain of engineered mosquito. We demonstrated that genetically modified male mosquitoes, released across 10 hectares for a 4-week period, mated successfully with wild females and fertilized their eggs. These findings suggest the feasibility of this technology to control dengue by suppressing field populations of A. aegypti. I’m sorry, but what? Exactly how are these mosquitoes, which have a change in one gene so that they require tetracycline to survive, going to harm a bat. Because, as I’ve stated before, the DNA/RNA of food sources do not get transferred to the consuming species. It’s physiologically impossible, and betrays a high degree of biological ignorance for anyone who writes that. Oh but there’s more. Will the more virulent Asian tiger mosquito that also carries dengue fill the void left by reductions in A. aegypti? Will the dengue virus mutate (think antibiotic resistant MRSA) and become even more dangerous? Wow, that’s like every logical fallacy wrapped together. How is antibiotic MRSA related to dengue virus. Dengue virus needs an appropriate vector to transmit it, and the symbiotic relationship between the mosquito and the virus occurred over 100 million years. Dengue cannot suddenly switch to another mosquito, like the Asian tiger mosquito which happens to actually be a much poorer vector for the virus. Besides Oxitec also has Asian tiger Frankensquitos. So there you go. 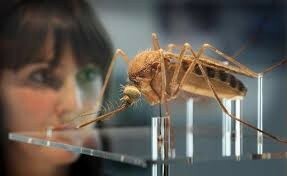 This is not an actual genetically modified mosquito. There has been substantial scientific research to develop products such as Oxitec mosquitoes proceeds progressively from the laboratory to confined trials to limited field trials. In each case, Oxitec formally informed the governing authorities of their actions, and received approval to do so. Oxitec has conducted field trials in the Cayman Islands, Malaysia, and Brazil, it is preparing to conduct trials in other countries, including the United States. Oxitec’s trials are always appropriately controlled and monitored, by its own and independent scientists, to ensure that they are safe and effective, and are frankly closely monitored by various regulatory bodies. But, as you know, when anyone starts discussing how genetic engineering can actually help our lives, science gets set aside and politics matters more. Activists, using the same techniques as all science deniers, whether creationists or global warming deniers, try to create a debate that sounds scientific, but never really is. 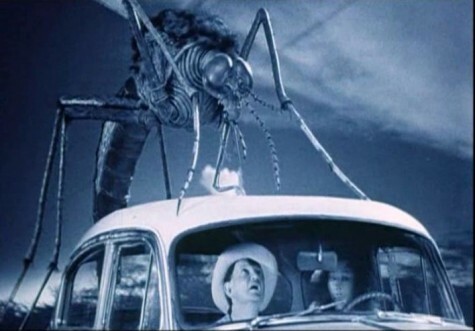 The fact is that molecular genetic engineering is more precise and predictable than older, cruder techniques like irradiation, for mosquitos. Ironically, the SIT method, using radiation, is mostly unregulated with little or no science that supports the safety and effectiveness of SIT. On the other hand, the regulatory reviews of genetically engineered living organisms have tended to be drawn out and excessively cumbersome throughout the world, with political debate delaying or preventing approvals. As a consequence, lifesaving technology, like the genetically modified mosquitoes, becomes more expensive, and possibly may never be employed to protect human health. The World Health Organization, by no means in the “pocket” of Big Pharma or Big Chemical (or Big Mosquito, I suppose) has requested that regulatory agencies emphasize “science-based, case-by-case targeted requirements with a degree of practical parsimony,” instead of relying on “a precautionary approach that can require data to address all theoretical risks.” In other words, quit delaying technology that can help mankind because of an oversensitivity to political debates that can be largely dismissed by real science. There are no convincing arguments, at least from a scientific point of view, that genetically modified mosquitoes pose any danger to humans, other animals, plant life, the environment, anything. However, we have boatloads of scientific evidence that shows that mosquito-borne illnesses, like Dengue fever, harm and kill human beings. We have boatloads of scientific evidence that these Frankensquitos can save lives by crushing the numbers of disease carrying mosquitos. Regulators have got to stand up for science and reject the ridiculous populist rhetoric that puts up pseudoscientific roadblocks to progress. The elitist anti-biotechnology cult seems to have one goal in mind, and it’s not to help humanity. They want to block anything that doesn’t support their narrow-minded view of the planet, that only some Naturalistic Fallacy, an Appeal to Nature, that the only right way doesn’t include biotechnology, because it’s not natural. That kind of arrogance is going to kill us all.